Interior design can change one’s perspective. Some of us will never visit the Victorian mansions in Newport Beach, Rhode Island. If we don’t travel to Asheville, North Carolina and search for the stately mansion, the Biltmore, built by George Vanderbilt, we would never experience the library with a grand scale fireplace. Only a few of us will stand in the grand hall of Althorp, the country manor that was Princess Diana’s childhood home, and pretend to be a princess. How about playing cards at the summer palace of Catherine the Great on the Baltic Sea? Perhaps we would choose to dine at a mahogany table in a Parisian apartment close to Montmartre, or relax in a penthouse at Trump Tower, overlooking Las Vegas lights, and enjoy a living room decorated with smart and snazzy furniture of today’s upcoming furniture designer, Christopher Guy. There is one destination to embrace all this, plus infuse your home with style, inspired by motifs of the past, present, and future. You can see old-world glamour juxtaposed with sleek contemporary; you can be excited by the capriciousness of color and calmed by the elegance of refined living. You can delight in interiors featuring bold zebra and faux crocodile, shimmery silk, and rich leathers. The caveat is that you don’t need to buy an airline ticket, or travel too far… simply visit deCondé’s. Considered the most awe-inspiring interior design and furniture showroom in the West, deCondés is mesmerizing. There is a reason that you will be captivated. 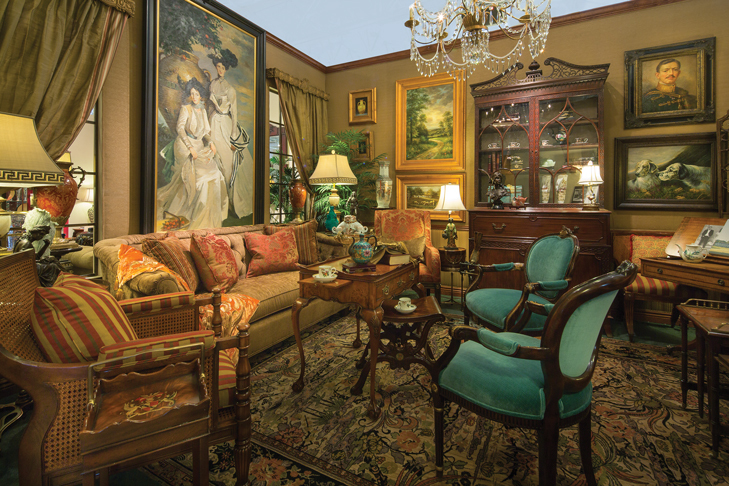 The showroom carries a pastiche of styles: French Empire, Louis XIV and XV; American Federal; Italian; the many forms of Traditional; Transitional to Mountain Modern; Asian; Art Nouveau; Rococo Revival; Russian Empire; Minimalist. Frankly, the list seems endless. Often, one of the staff will spy a customer, seated in deCondes’ Treasures Room, who is enchanted—transported to another time and place. This drawing room features reproduction pieces from Althorp, the childhood manor of Princess Diana and the ninth Earl of Spencer. Also captivating is the Malachite Room, with Russian pieces reproduced from the Hermitage in St. Petersburg. deCondé’s is a privately-owned business of 40 years, directed by two creative and distinguished gentlemen with silver hair, Ken deCondé and Harry Warrick, who have cast a mood of elegance with their purchasing savvy. “We want to excite your senses. Design and color can do that, even art history,” says Mr. deCondé, as he points to the large blue and white porcelain sword holder in the front window, acquired from a private collection in China. deCondé’s has found a home on Highland Drive in Sugar House, a charming area of Salt Lake City. The family name is a respected moniker on the street and well known because the main showroom and three other stores. 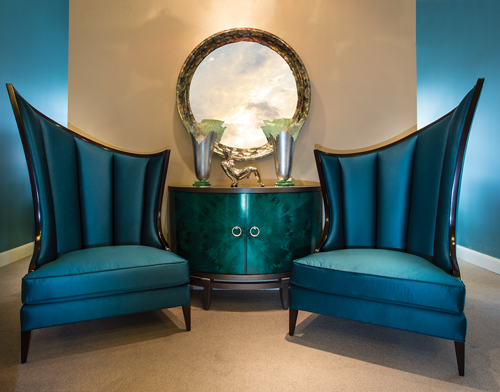 Fifty paces from the main building is deCondé’s Warrick Leather Gallery, a showcase of home office and leather furniture curated from quality names. Located two blocks north of the main showroom is deCondé’s Accents, a novelty boutique with original art, sumptuous upholstery, and hand-painted wood pieces. 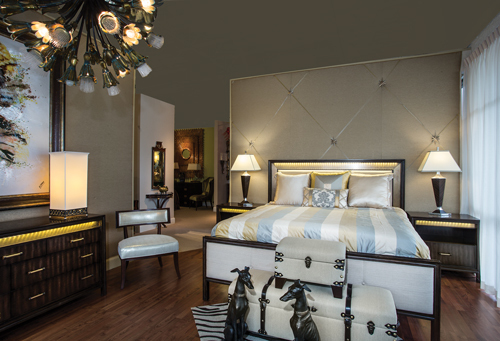 A short walk across the parking lot leads you to the deCondé’s Clearance Center, where patrons may choose from exquisite pieces ready for a home. Perhaps there is a scratch here and there, a ding in the brass; some may be a few years old, and purchases are “as is.” However, they are still grand for amazing discount prices. Be it crystal from Daum, Moser, or Lalique; Murano glass chandeliers from Italy; woven tapestries; furniture pieces inlaid with mother of pearl; Chinese red lacquered chests; bronze statuary or carved jade from the Orient, deCondé’s showroom is a treasure house of finery. Versace’s fine china is a phone call away. Mottahedah place settings often grace the mahogany table of the moment. deCondé’s also carries many furniture, lighting, and accessory lines known for their uniqueness and beauty. Don’t stay away too long. Chat with one of deCondé’s interior design staff who will design a magnificent home just for you.